It can be hard deciding which goals to focus on in your business when you have a million and one ideas. This often leads us to work on several different projects at the same time and never actually completing any of those projects, which then leads us to be unsuccessful in achieving our big goals. This can be a never-ending cycle. 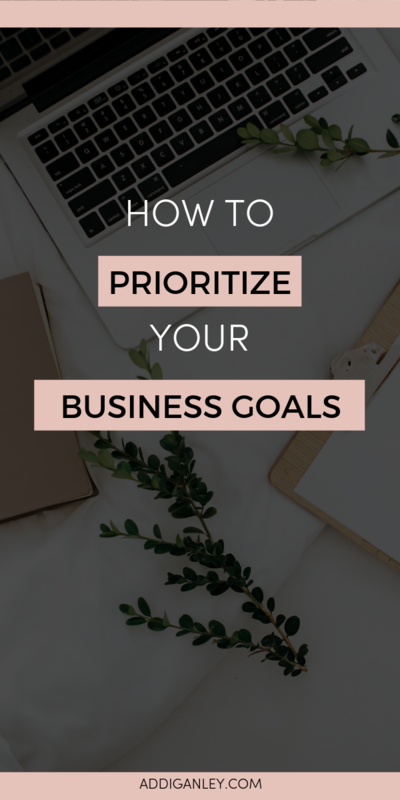 Today, I want to share with you an easy way to prioritize your goals so you know what you should work on first to have an action plan for your business. The first step is to do a Braindump. Find a few minutes in your day to sit down and write down all of the goals that come to mind. It doesn’t matter how big or how small those goals are or whether they are short term or long term goals. The purpose of this exercise is to get all of the ideas out of your head so you can really focus on your work. As you work through your braindump, you might realize that there are 10-15 different things that you want to be working on right now, but that just isn’t possible! No matter how much time or energy you have, you can’t possibly work on 10+ things at the same time. This is how entrepreneurs get burnt out and end up not meeting any of their goals. There isn’t room to work on 10 different goals at the same time, so you have to prioritize the items on your list and establish an order that you should work on them. You also need to think about IF you actually want to commit to all of the goals that you wrote down. You might realize that some of the goals you wrote down were nice ideas in theory but that you don’t actually want to commit to that idea and work on it at all. Once you have all of your ideas listed out, it’s time to prioritize the items on that list. The way that I do this is to work through a series of questions to help me rank the items in the list and prioritize them. Am I ready to invest my time and energy into this goal? Am I doing it for myself? Which one makes me feel the proudest? Do any of these goals give me a sense of urgency? Go through this for each of the goals that you wrote down. You might realize as you go through the list that there are goals that you can just cross off. That’s good. It is part of the prioritizing process. There may be other goals that feel very urgent right now. These are the items you want to start with. After you have gone through all of the items on your list then you can rank them in order of what has the highest priority. This will help you then create an action plan for your next quarter. Now it is time to create your action plan for your next 90 days. This plan will guide you so that you know exactly what to work on every single day. You want to choose one goal to work on for the next quarter, or 2-3 smaller goals and work on one of those each month. Once you have your goals you can then break each one down into individual tasks. This is what will make up your weekly and daily schedule for the next quarter. Make sure that the steps you create are both actionable and manageable. It’s easy to become overwhelmed if you’re setting goals and steps that can’t actually be achieved but on the other hand, being able to regularly tick things off your to-do list is a great motivator. Going through this process will help you to see what is the MOST important goal that you need to be focusing on in your business right now. Once you’ve achieved that, you can move on to the next one from your list.